This machine is used for pig killing and shackling after stunning process, then lifted onto bleeding line for further bloodletting. 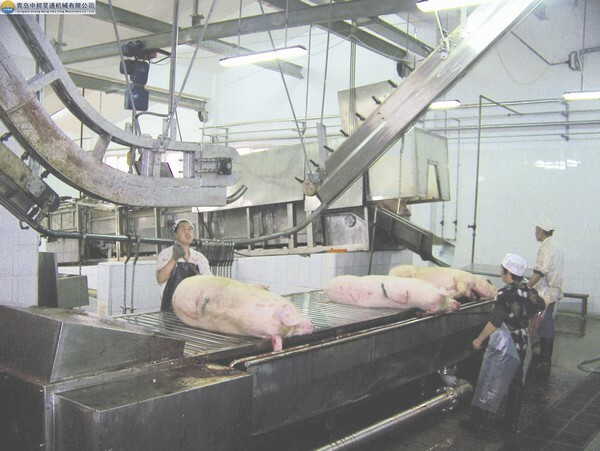 Pigs slide outside from stunning machine, then placed on this conveying platform for vacuum bloodletting operation. On the two sides of this platform, blood collection chute and faeces collection chute is fixed to meet hygiene requirement. This conveying platform is the necessary equipment for big and medium slaughterhouse plant. ZBHT Slaughtering Machinery Co.,Ltd. manufacturing high-quality Horizontal bloodletting conveying platform and supply OEM, ODM service according to your personal requirement. Our Horizontal bloodletting conveying platform and other Pig Slaughtering Equipment is not only good in quality but also competitive in price, welcome to inquiry us about the details of Horizontal bloodletting conveying platform or other slaughtering machine products and accessory equipment.